Guwahati – 20 May, 2016: Akshaya Patra celebrates the occasion of serving its 2 billionth nutritious meal from its Guwahati Kitchen. The celebration took place during the launch of Jamie Oliver’s Food Revolution in India. The students of our beneficiary school, Mrilanlini Devi Shishu Niketan were served. The students, teachers and parents enthusiastically participated in the celebration. Akshaya Patra caps were distributed to students. 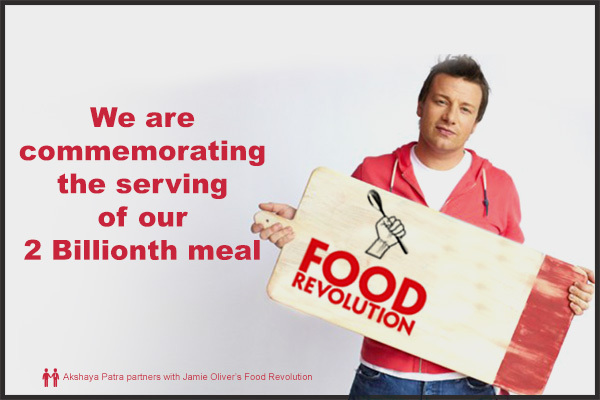 The event was live streamed on Jamie Oliver’s official Food Revolution Facebook page as a part of his on-going Food Revolution celebrations. The Akshaya Patra Foundation has entered into partnership with world acclaimed chef Jamie Oliver’s Food Revolution, a global campaign that aims to reform U.S. school lunch programme. The Food Revolution intends to provide access to right information and education thereby creating a hale and hearty world.